Claire Brownell (Elizabeth Proctor) and Fletcher McTaggart (John Proctor). Photo courtesy Alexander Weisman. The Crucible by Arthur Miller is based on true events surrounding the Salem witch trials—which began with several young girls (ranging in age from 9 to 20) accusing local townspeople of bewitching them. 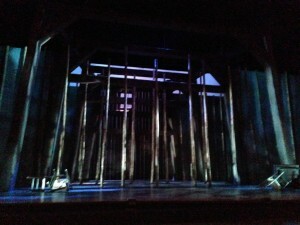 Pioneer Theatre Company’s The Crucible. The history of these gruesome events of 1692 has fascinated Americans for more than 300 years. Hundreds of men, women and children were falsely accused, imprisoned and tortured. Nineteen innocent people were hanged on Gallows Hill. At times during opening night, Pioneer Theatre Company’s (PTC) staging of The Crucible left the audience reeling as the mass hysteria perpetuated by children crescendos. Play-goers sat in awe as otherwise sensible adults let their friends and neighbors become unwilling victims to wanton injustice based on nothing more than the rantings of children. However, if any of the real participants were as excellent of actors as Madison Micucci, who plays Abigail Williams as the fiery ringleader of the child accusers, it would be no wonder they were believed. J. Todd Adams (Reverend John Hale) and Fletcher McTaggart (John Proctor). L-R, kneeling: Stephanie Weeks (Tituba) and Madison Micucci (Abigail Williams). Photo by Alexander Weisman. 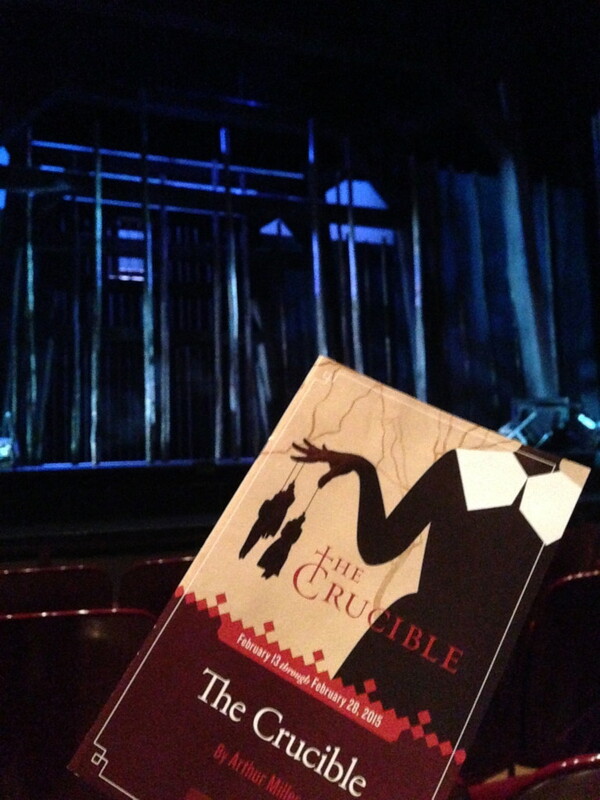 PTC’s cast for The Crucible is filled with talented actors—some familiar faces to regular theatre attendees in Salt Lake. Rebecca Nurse, played by actor Anne Cullimore Decker, makes a grand tragic figure. She’s the touchstone that turns the previously “neutral observer” character of Reverend John Hale (J. Todd Adams) into a doubter of the events unfolding when Nurse is accused and then sentenced to death for witchcraft. Decker is as memorable in this role as she was in Righteous & Very Real Housewives of Utah County and garnered The States Most Influential Artists award in 2014. Newer faces to the PTC stage include the main characters Claire Brownell who plays Elizabeth Proctor and her husband John Proctor, acted by Fletcher McTaggart. McTaggart’s portrayal of a hard-working, church-attending but flawed man is heartfelt and powerful. He honors his individual conscience in the final scene when he refuses to confess to acts which he did not commit. Throughout Act II, as the injustices to God-fearing townspeople mount, I did find myself sitting in the audience thinking: this sounds a lot like the religious freedoms vs. civil rights arguments going on at the Utah State Legislature as of late. Too bad that it’s 2015 and The Crucible recounts events of 1692 but the religious bigotry festering just below the surface remains, in many ways, similar. The Crucible Director, Charles Morey, writes that the play is “not really about why it happened, but about what this moral crisis brought forth from the average men and women at the center of it.” But PTC has a knack for staging productions that poke at the sores of our fair state and The Crucible, unknowingly, is timed impeccably nonetheless. 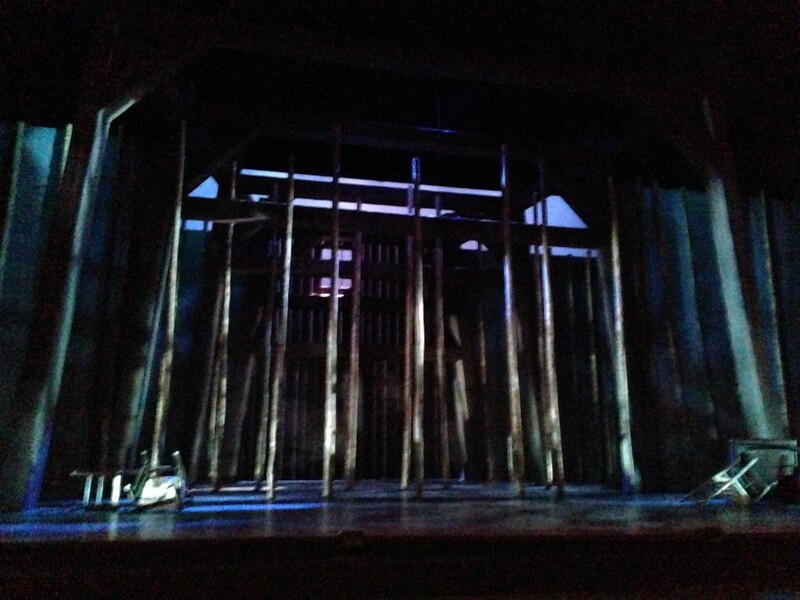 The Crucible runs through February 28 with evening and matinee performances at Simmons Pioneer Theatre on the University of Utah campus. Tickets can be purchased here or by calling 801-581-6961. I regret seeming to be a grammar snob, but reviewers should write carefully or the value of their comments become suspect = “Nineteen innocent people were hung (sic) on Gallows Hill” should be written using the correct verb “hanged” — Thank you. You are correct. I used the same phrasing as the program but meant to look it up to confirm before posting and forget.